The Nikon D4 is arguably the worlds best general purpose DSLR. It has one of the best sensors amongst all DSLRs, it is fast and yet power efficient. It has fantastic low light performance but at the same time has improved dynamic range over competitive cameras. It is rugged yet lighter in weight than previous D3 series cameras or the competition. This page is devoted to the D4. Apart from the differences in resolution, high ISO capabilities and frame rates, the D4 has a few other differences from the D800 in terms of features that may not jump out from reading the camera specifications. The D4 allows function buttons to be assigned to MY MENU. This essentially allows a quick jump to frequently used menu items. The Video Rec button can be customised in D4 but not in D800. In particular you can set the Video Rec button to modify ISO settings. When the AF area is expanded, the D4 can show the expanded area using dots in the viewfinder. The D4 can shoot full HD video in 2.7 crop mode. In Live view mode, the D4 can shoot still images for 5 seconds at 24 frames per second at HD resolution (jpeg only). The shutter is kept open during this time. In Video mode, the D4 supports frame grab whereby at any point the user can save an individual frame at HD resolution without interrupting video recording. In DX-based movie format, image quality is equivalent to movies recorded at a frame size of 1280 × 720 even if full HD is chosen. D4 sensor is 16mp whereas the 1DX sensor is 18mp. 1DX has reduced mirror blackout of 60ms. 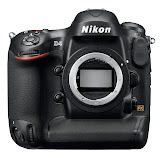 Nikon do not publish D4 mirror blackout but I assume it is the same as D3, i.e., 74ms. The 1DX features more cross type AF sensors than D4 (41 versus 15) and also features dual cross sensors in the central column. There are differences in the availability of cross type sensors at various apertures. The 1DX shutter lag is 55ms, but can be reduced to 36ms at max aperture, whereas the D4 has a lag of 42ms. The D4 shutter lag spec is CIPA standard so it is not directly comparable to 1DX - before adopting the CIPA standard, Nikon's D3 bodies had the lag specified as 37ms, so I expect the D4 is the same. 1DX can shoot at 12 fps with full autofocus, while D4 can shoot up to 10 fps with full autofocus. The D4 battery capacity is 2600 shots compared to 1120 shots for 1DX (CIPA standard). The D4 displays AF points in red inside the viewfinder as you shoot - the 1DX displays them in black by default. Canon have released a firmware upgrade that causes the selected AF points to blink in red as you shoot (see this video for how the firmware upgrade works). The D4 body only weight is 1180g versus 1340g for 1DX. The D4 with battery weighs 1340g. The 1DX buffer capacity is 38 RAW images whereas for D4 it is 75 14-bit / 92 12-bit RAW images. The D4 can output uncompressed full HD video via the HDMI port. In video mode the D4 has support for full time AF. The 1DX viewfinder has a higher magnification of 0.76x compared to 0.7x of D4. The viewfinder eyepoint for 1DX is 20mm compared to 18mm for D4. The 1DX allows focusing screens to be changed whereas the D4 does not. The 2.7 crop HD video feature is unique to D4. The D4 sensor performance has been analysed by a few sites - links below. What these tests show is that the D4 sports one of the finest image sensors. It strikes an excellent balance between high dynamic range & great low light performance. The D800 series have greater dynamic range at low ISOs. Compared to the Canon EOS 1DX - both cameras have similar high ISO performance but D4 has better dynamic range from ISO 100 to about 1600. See links above for detailed sensor performance figures. The great thing about the D4 is that I can shoot under any light condition without worrying about noise. I have currently set the high iso limit to 6400, but plan to try 12800. The only reviewer I trust to do AF tests for sports photography is Rob Galbraith as he is a sports shooter himself. His review of the D4's autofocus performance can be found in his article A few thoughts about the D4. Unfortunately Rob is no longer updating his web site so we are unlikely to see a test of 1DX. I do not shoot sports, but will report my experience of the D4 for general photography as I have more data. My experience so far is mixed. I have not had great success with getting my small dog in focus as he runs towards me in the garden. I had difficulty with this subject with the D300 as well; so am not sure if this is a generic issue with subject size and contrast. The tests I have done were with the 50mm f1.4 AFS, the 105mm AFS Micro, and the old non-AFS 24-120mm zoom lens. Neither lens gave me a good success rate. It is possible that my technique is faulty, or the settings I am using are not right - although I have tried various settings, and made several attempts. I am of course on the latest firmware version. This video shows the D4 shutter in action in slow motion. It is interesting to see the impact of the shutter causing the pin at the bottom right corner to move; this is probably attached to the mirror balancer that absorbs the kinetic energy of the mirror impact. For comparison, you can see the D3 shutter in action in this video. Thom Hogan reviews the D4. He calls it a superb camera.